Gather the family for some festive LEGO building fun with this charming model featuring a full circle of track, boarding platform with bench and lamppost, a Power Functions upgradable train engine with brick-built smoke bellowing from its stack, coal tender, flatbed wagon with a rotating holiday tree, toys and gifts, and a red caboose with a detailed interior and table. The train engine also features large and small red-colored locomotive wheels and the train is decorated with green wreathes, string lights and white tree elements. This LEGO Creator Expert set includes 5 minifigures. Includes 5 minifigures: a locomotive driver, ticket collector, grandmother, boy and a girl. The Winter Holiday Train includes 16 curved pieces of track, engine, coal tender, flatbed wagon with holiday tree, toys and gifts, caboose, boarding platform, bench and a lamppost. Decorate the Christmas tree and drive the train to see the tree rotate. Join the ticket collector in the cozy caboose for a delicious cup of cocoa. Includes dual building instructions for a perfect family build. Accessory elements include green wreathes, decorative lights and white tree pieces, plus wrapped gift elements and tiny brick-built toys, including a micro train, wind-up car, fire truck, remote controlled robot, sailboat and a spaceship. Special elements include small and large red train wheels, dark tan windows, train buffers, cow catcher, white tree elements and roller skates. 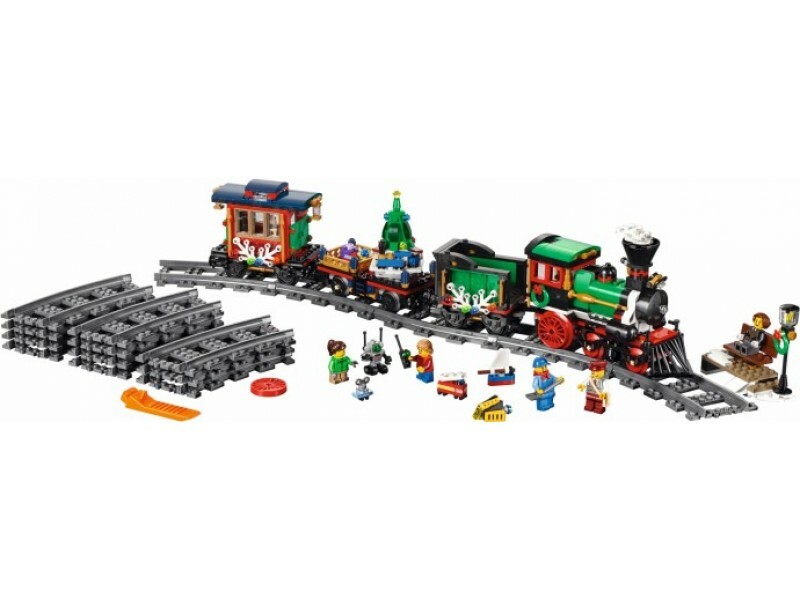 This set includes over 700 LEGO pieces, including 16 curved tracks. This set offers an age-appropriate building experience for ages 12+. The Holiday Train in total measures over 12cm high, 52cm long and 7cm wide. Curved rail track diameter measures over 70cm.